If you head for Hive Beach, which many of you will know, you will see a sign to The Seaside Boarding House. 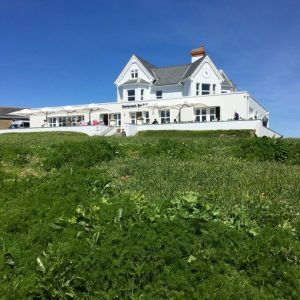 It enjoys a spectacular view over Lyme Bay and, unlike Hive Beach, it is rather more comfortable, roomy and cosy… and there is plenty of free parking. Created by the same team as the Groucho Club, you will find meticulous attention to detail here. On your left there is a large bar with tables where you can eat or just have a drink or a coffee or tea. Beside this there is a restaurant where you can enjoy a slightly more formal meal. There is a good-sized terrace where you can eat and drink when the weather permits. Well-behaved dogs are welcomed, in keeping with an informal, relaxed atmosphere. The menu is well balanced with fish and meat dishes on it. There is a good value daily set menu from Monday to Friday at £15 for 2 courses or £18 for 3. We didn’t choose this option but enjoyed a cheese souffle and a scallop dish for starters, followed by fish and chips and moules marinière for mains. Nicely cooked and presented, served by cheerful, efficient staff. Definitely a place to which we will return. Apparently the rooms are very nice too and they do terrific breakfasts, whether you are staying there or just eating! The Seaside Boarding House is open seven days a week for breakfast, coffee, lunch, tea and supper. Reservation is recommended. Thank you Gordon & Adrian for recommending this to us! Opened a decade ago already, the King John Inn in picturesque Tollard Royal is well worth a detour. Open for food 7 days a week, the pub offers a fine selection of draft beers for the beer drinkers amongst you. The decor is a mixture of modern and traditional, with a stunning new pale oak bar and a quarry tile floor of reclaimed red tiles. Lovely selection of framed country photographs on the walls. Mixed scrubbed oak tables. Open log fire. Immaculate loos. It’s all exactly as it should be and has been done with excellent taste. We arrived just after noon and were the first there. A relaxed and smiling welcome set the tone and we were shown to a nice table by the crackling open log fire. The menu when we visited for lunch was quite small but full of interest. Hot out of the oven bread (The King John Bloomer) was crusty and delicious. Recent starters have included Moules Marinière; lightly dressed Portland crab on sourdough toast; smoked stone bass with beetroot; Carpaccio of rose veal. 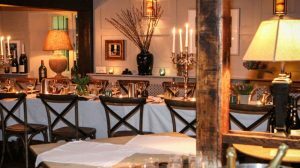 Mains such as a pigeon breast salad with crispy bacon and croutons; pan-fried Gurnard with crushed potatoes and curly kale; twice baked Cheese souffle; fish and chips; fillet of cod with crispy oyster and a lobster sauce. There was a good selection of puds from which we shared a chocolate and orange fondant. The food was all well prepared and nicely presented, without being too “fussy”. Service by our friendly waitress who has been there for ages (but whose name I have forgotten) and by the owner Monika, was very good and well informed. A three course meal will set you back £30 to £35 not including drink. 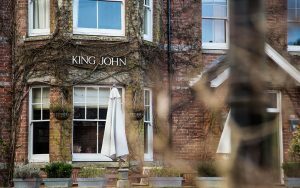 The King John has kindly agreed to be listed as one of our recommended restaurants and are pleased to offer 10% discount off lunch and dinner Mondays to Thursdays. Just mention you are a member of Trencherman’s when you book. 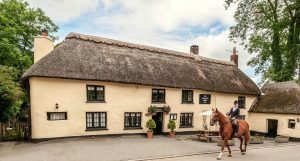 Believe it or not, this Michelin-starred pub, set in deepest Devon, offers a lunch menu of £25 for 3 courses or £20 for 2. This is amazing value, as Mark Dodson has to be one of the top chefs in the country, having spent 13 years at the 3 star Michelin Waterside at Bray. Of course, we can never resist the a la carte menu! Our favourite starter is the seared peppered tuna with Oriental salad. It is just mouth-wateringly delicious! This time I plumped for the Arancini with Beetroot three ways which was very good. Main courses were fillet of brill with a potato crust, caramelised little gem, cucumber and capers with a creamy cider sauce; and Monkfish wrapped in Prosciutto ham with breaded mackerel and scallops. Other mains included fillet of Venison, Breast of Guinea Fowl and fillet of beef. As one would expect, presentation is always perfect as are the different textures of each course and the accompanying sauce. Ethne’s chocolate cheesecake with peanut butter ice-cream rounded off another terrific meal. Mark & Sarah look forward to welcoming you at their pub . 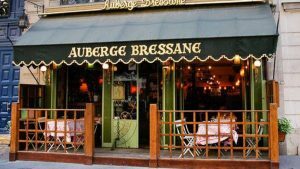 The Auberge Bressane has become one of our favourite restaurants in Paris. The food, atmosphere and service are consistently excellent. It is in the septième again, a short walk from the métro École Militaire. As soon as you enter you are warmly greeted, coats taken and shown to your table. It’s a small cosy place and feels “right”. The menu has many “classics” such as escargots, cuisses de grenouilles (frog’s legs), wonderful soufflés both savoury and sweet, scrambled eggs with truffles, fried squid, sole, turbot, kidneys, Chateaubriand steak, Tournedos Rossini, coq au vin, and so on! The wine list is superb and varied. The service is always very friendly and, if you like Frogs legs, which we both do, they produce some of the best. This is a big, bustling café/brasserie on a busy crossroads. Sounds ghastly, doesn’t it? But actually it’s a great place to sit over a coffee or a glass of wine and people watch. It’s always full of life and the service is excellent and very fast. There are usually about 6 waiters on duty, each with his own area to patrol. 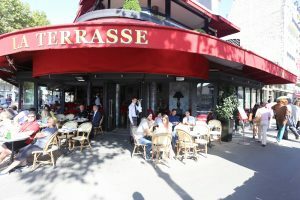 The food is just what you would expect in a Paris Brasserie and is all freshly cooked and appetising. Most of what the French call “les Incontournables” are to be found on their menu. Caesar Salad, Snails, Steak Tartare, Steak Frites, Chicken & Chips, Sweetbreads, Chocolate mousse, crème caramel, crème brûlée, rhum baba to name but a few. This is not gourmet dining, but it is good honest fare, well prepared and served with a smile at almost any hour you choose to eat and booking is not necessary. What more could one ask for?! We hope that not too many of you will be away on holiday and that you will be able to come on one or other of the days. This is one of our biggest tasting of the year. As usual, this will be held in our Tasting Room off the yard behind the shop building. It’s always a sociable occasion, so we hope that this appeals to you and that you will be able to spare the time to come on one or other of the above days. When the weather is dry and has been for a few weeks, do please feel free to park on the grass through the yard behind Trencherman’s. However, if it has not been dry, please do NOT park on the grass or you will get stuck! The weather at the end of our winter and in to early Spring has been typically British – a complete mixed bag! The early flowers have done very well. 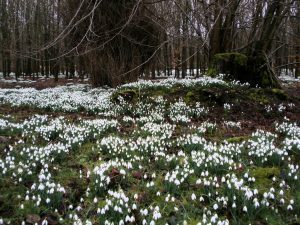 Snowdrops and crocuses were wonderful this year as were/are the magnolias. Primroses have been out for some time and some early bluebells and cowslips are already out. Quite a few trees and bushes are sprouting pale green leaves. The amazingly warm weather at the end of February allowed some people to give there lawns a first haircut, but then most of March was gloomy and wet until last weekend when the ground became dry enough to give the grass another cut. Fingers crossed for a good, warm spring and a lovely hot summer like last year! These are ever popular and we are always amazed at how they fly out. Our apologies for the lack of choice after Christmas, but we were all but wiped out and have only just about got back on an even keel. We have a choice of about 10 meals at the moment and are making more each week. The latest ones to be made were a Guinea Fowl in a Cider and Calvados sauce, a Crab Fettucine and a Vegan Nut Roast. There have been lots of pigeons around and our pigeon shooters have been busy controlling them… so we have quite a few in stock! They’re easy to cook and quite delicious. Down from £6.95 to just £4.95 for 10 while stocks last. Our olives are renowned, especially the large green Gordal! We have Manzanilla (like a baby Baby Gordal) on offer and we will be offering them at half price! We have a really good range of pastas: Spaghetti, Linguine, Tagliatelle Nests, Tagliatelle, Orzo (rice shaped), Tonnarelli al nero di sepia (black squid ink pasta), Cannelloni, Gargarnelli, and Lasagne. We seem to have a glut of Fettucine so that is on offer at 20% discount. This is our own invention and is a really good non-meat alternative. You can eat this either as a starter or as a main course. It is quite rich, so if you use it as a starter, you only need a smallish ramekin per person. Ingredients for 8 as a starter or 4 as a main course. Melt the butter in a non-stick saucepan. Add the flour and blend, stirring all the time. Cook for a couple of minutes to cook the flour, still stirring. Remove from the heat. Bring the milk to near boiling. Place the butter and flour mixture back on a very gentle heat and add the milk a little at a time stirring constantly with a whisk. Season with lots of black pepper and a little, but not too much, salt. This will only take a couple of minutes. Remove from the heat and set to one side. Butter your dish or dishes, depending on whether you are using 8 ramekins or one dish. Place a layer of soaked (or “no pre-soak”) pasta on the bottom, cover with a mixture of crabmeat and prawns, together with some of your white sauce and generously sprinkle with Parmesan. Place another layer of pasta on this, then more crab and prawns and white sauce and so on, until the dish is not quite full. Place a final layer of pasta on top, cover generously with white sauce and sprinkle with grated Cheddar or Gruyere and a bit more ground black pepper. Cook at 425F / 220C / Gas 7 and for 20 to 25 minutes until bubbling and golden. My mouth is watering at the thought!